Iris Bavelaar is an expert when it comes to beauty and design. As a Graphic Designer, Art Director and Illustrator with a fantastic sense of style, she knows exactly what true beauty is and she loves to share it with us. In this article, she tells us why natural materials like jute, wood and bamboo are so trendy this season and also the next. No matter if you want to be environmentally friendly or not or if you are interested in bringing the beauty of nature to a room, no one can deny that natural materials look good in your interior. So, no wonder that the natural trend is highly appreciated by both designers as home owners. Besides that it looks pretty and it is mostly a more sustainable option, it has more advantages. Here, you will read some of the reasons why natural materials cannot be missed in your interior. First of all, natural materials are timeless because the use of it exists almost as long as the concept of interior design itself. In addition to that, natural materials have neutral tones that suit almost every color scheme. Next to traditional materials like jute, wood and bamboo, nowadays there are a lot of new materials that look just as pretty and have improved features. For example, this basket made of water hyacinth: the natural fibres give this basket a firm body and artisanal look. It is the perfect combination of tradition and modernity. 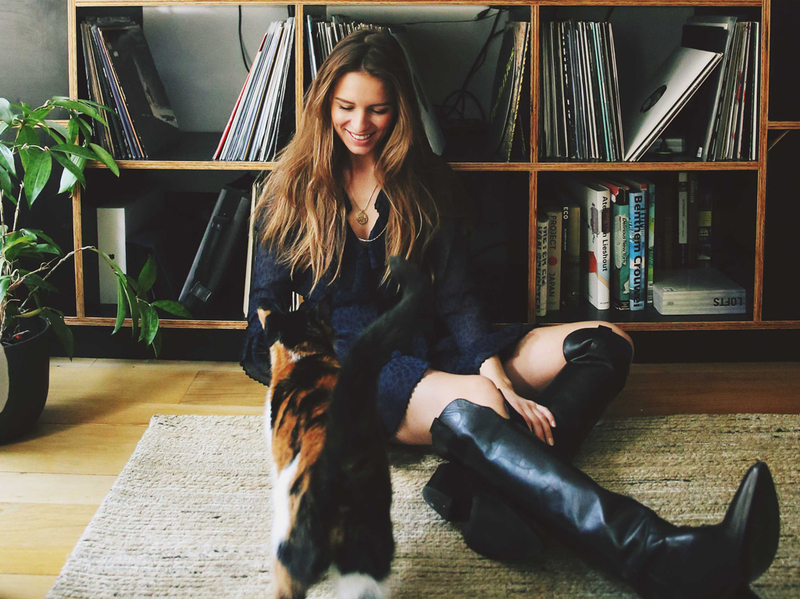 Combine it with a furry carpet or a knitted item for a soft look. Natural materials are more sustainable than their artificial doubles. They last longer, because their quality is usually higher, but also because they are resistant and easy to combine with different styles. Next to that, they can easily be recycled and mixed with other natural materials. This creates a beautiful new design of previously discarded materials. Take this carpet, made of jute in combination with recycled silk. Jute gets obtained from plants and is after cotton the most used natural material. This edgy material is often used for carpets or baskets. Jute gives a rough but relaxed vibe to your interior. Natural materials are multifunctional and are easy to combine. For that reason, you don´t have to be afraid of mixing natural materials with different styles. Whatever your interior style may be, there is always a natural material that matches well with it. And as long as you keep your color scheme natural, your base will stay calm. You can combine it with industrial materials that look raw and unpolished and have modern details for example. 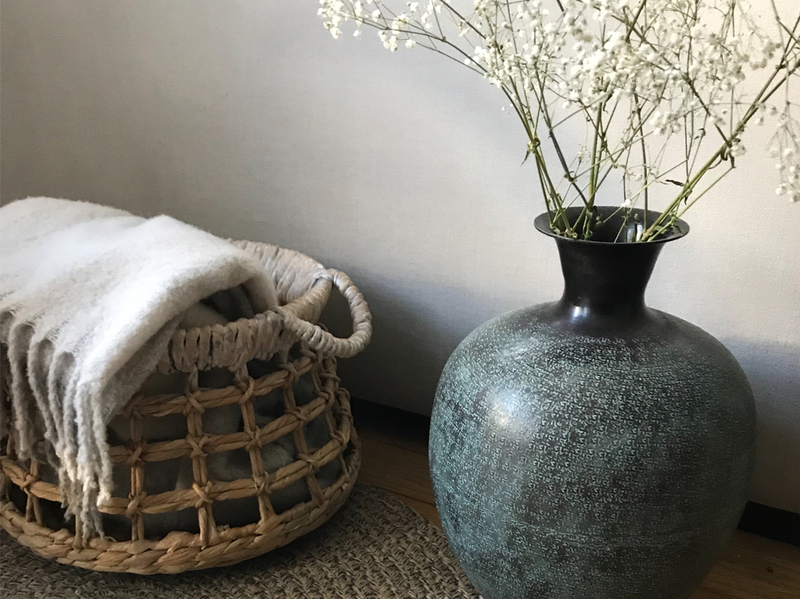 By combining this black industrial floor lamp with the soft look and tones of this basket and carpet, you give the whole ambiance an edgy touch. Natural materials benefit your well-being. 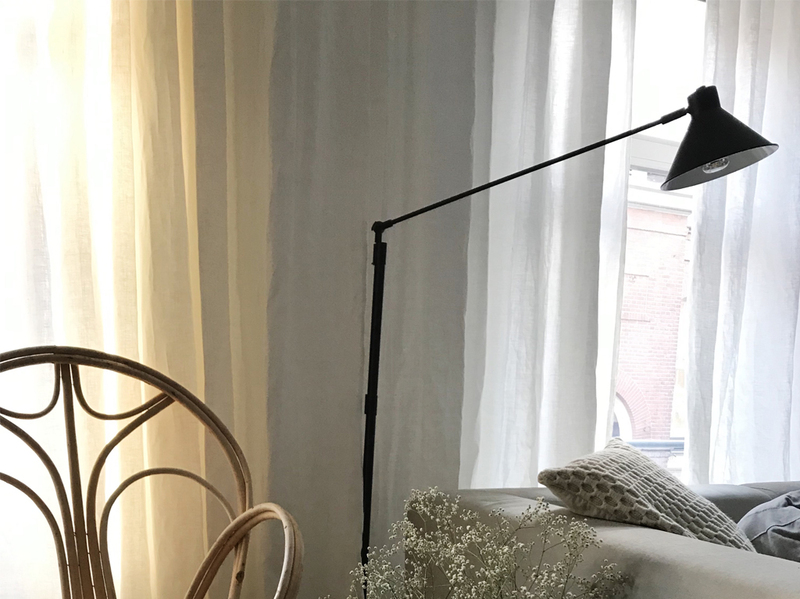 Being in nature is good for your well-being, but most of us don´t have the time to go for a walk in the woods every day so luckily it is possible for us to get nature into your home. And what better way of doing so than decorating your interior with plants? Plants give your interior not only a boost of freshness, but their air purifying effect will also benefit your indoor climate. A nice twist: put a plant in a basket made of cane or jute instead of a pot. Are you not the best in taking care of plants? Decorative grasses or dried branches in combination with earth tones will also do the tric. 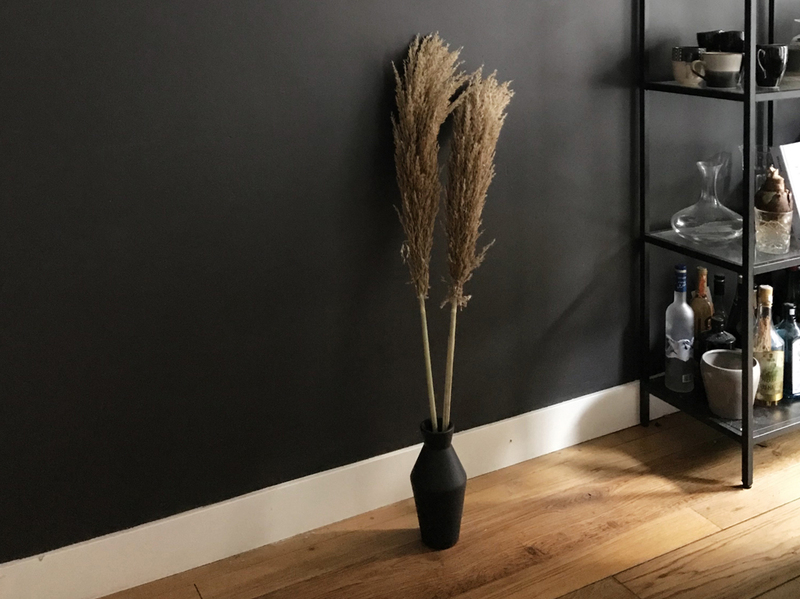 You can try to style a beautiful big vase with pampas grass or dried hogweed.